We should consider making the customizer controls contextual to this behavior. So yes, I suggest we add is_front_page as the active_callback for the header_video and external_header_video. 38778.0.diff​ (1.4 KB) - added by westonruter 2 years ago. header-video-notice.mov​ (5.9 MB) - added by westonruter 2 years ago. header-video-notice.png​ (99.1 KB) - added by westonruter 2 years ago. 38778.1.diff​ (3.4 KB) - added by westonruter 2 years ago. 38778.diff​ (3.4 KB) - added by joemcgill 2 years ago. 38778.notification.diff​ (3.5 KB) - added by westonruter 2 years ago. header-image-control-notification.png​ (143.4 KB) - added by westonruter 2 years ago. 38778.notification.2.diff​ (3.4 KB) - added by westonruter 2 years ago. Related: The patch would need to be updated if #38738 makes it in, to the more general is_header_video_active() (naming of that function is yet to be determined though). @flixos90 I don't think is_header_video_active() is relevant? The active_callback in the patch controls whether or not the controls are shown or not. You wouldn't want to use is_header_video_active() as the active_callback because then you'd never be able to access the control to set the header video. I think you're talking about has_header_video(). The function is_header_video_active() checks (via theme support) for which areas of the theme the header video is supported at all, as we decided that there might be themes that want to display the video elsewhere, not only on the front page. It would be a replacement for all the currently hardcoded is_front_page() checks, so I think it would need to be used here as well. This ticket was mentioned in ​Slack in #core-themes by westonruter. ​View the logs. I would suggest that the customizer behavior should follow the expected behavior set by the theme (see related #38738). Therefore, if the theme has only set video header support on the front page, customizer preveiws should only show the video header on the front page. However, if I'm understanding the issue correctly, this is stating that we should only show the customizer controls on pages where the video could actually be active. If that is the case, then @flixos90 is correct, that the same callback we're discussing in #38738 should be used for both purposes unless there are technical reasons not to. I wonder, however if it would be a weird user experience to see a "Header Image" panel on internal pages and "Header Media" on the front page. Would it be better to disable the controls but still show them on pages where the video won't be shown? @joemcgill they'd still see “Header Media” as the section title regardless. The condition for switching between “Header Media” and “Header Image” is whether or not the theme includes video in its custom-header support. 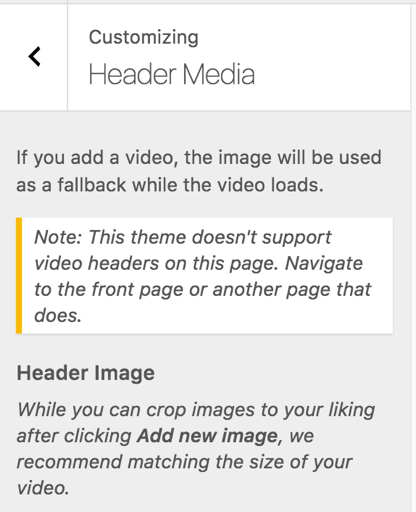 So the question is just what to do with the header_video and external_header_video controls, whether they are shown when URLs are being previewed for templates which do not allow videos to be used in the header. Or should there be a different “informational” control that is shown when ! is_front_page(). Ah. Thanks for clarifying. I like the idea of an informational control that reads something like "This theme doesn't support video headers on this page. ", but hiding the video controls in this case seems acceptable to me too. Unless someone has time to do some quick UX research, I'd be ok with hiding the controls. Let's use the same active callback for this and for #38738 regardless, and I think the name should include the word "video" somehow unless the callback could be used to deactivate header image support on certain pages as well. @joemcgill take a look at header-video-notice.mov​ and let me know if 38778.1.diff​ is good to commit. @westonruter in 38778.1.diff​, I like the wording but the use of the \261E seems out of character for WP. I don't think we use that pattern anywhere else. What if we showed that message inside a customizer notice instead? 38778.diff​ is a quick riff on what that might look like. I think the name should include the word "video" somehow unless the callback could be used to deactivate header image support on certain pages as well. Should we build in future compatibility for needing to use the active callback for more than checking video support? If not, then I think we should use the name video_active_callback as proposed in 38738.7.diff. @joemcgill yeah, the styling wasn't very good. See 38778.notification.diff​ and header-video-notice.png​ for an actual customizer control notification notice. This uses the actual Notification API. A downside with this is that the notification is shown inside of the Header Image control, so it appears under that control's heading. The notice could be moved above, using the markup/logic from 38778.1.diff​ but the styles from the notice. Thoughts? The “active_callback” is part of the customizer API. What you're looking for is using something more specific than is_front_page not something different than active_callback. In other words, you're looking to add an active_callback that is something like can_serve_video_headers_for_current_template. But this is out of scope for this ticket and should be addressed in #38738 instead. This ticket was mentioned in ​Slack in #core-customize by joemcgill. ​View the logs. +1 for the notice approach. Can we use the notifications API for that, though? 38778.notification.diff​ feels a bit hacky. Agreed. I've opened #38794. We need section-level notifications to support that properly. Customize: Add notifications API to sections and panels. Adds a notifications property to instances of wp.customize.Panel and wp.customize.Section. Adds a setupNotifications() method to Panel, Section, and Control. Adds a getNotificationsContainerElement() method to the Panel and Section classes, like Control has. Replace hard-coded notification in header media section with a notification. Limit rendering notifications to panels and sections that are expanded, and to controls that have an expanded section.